This is a delicious tender drop shortbread, different from typical firm styles. 1. Preheat oven to 350 °F. Beat butter until light and fluffy. Sift in icing sugar and beat again until fluffy, scraping down sides of the bowl often. Sift in cornstarch or rice flour and blend in. Sift in all purpose flour and salt and mix until dough comes together (it will be soft). Stir in vanilla. 2. Spoon large teaspoonfuls of cookie dough (or use a small ice cream scoop) onto an un-greased cookie sheet, leaving 2 inches between cookies and bake for 18 to 20 minutes, until bottoms brown lightly. Remove from cookie sheet to cool. 1. 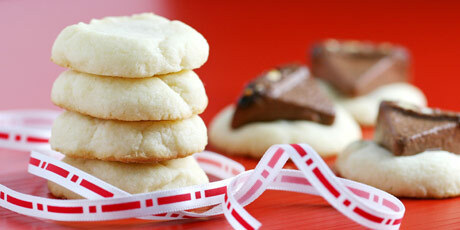 Prepare shortbread recipe as above and spoon onto an ungreased baking sheet. Press a triangle piece of chocolate nougat candy into the center of each cookie and bake for 18 to 20 minutes, until bottoms brown lightly.